These are the data points that will move the e-tailer's stock on Friday and beyond. Amazon.com (NASDAQ:AMZN) will report third-quarter results on Thursday night. These three key details will deserve your full attention in that report. Management's financial guidance pointed to net sales of roughly $32.2 billion, or 27% year-over-year growth. Operating income was given a wide open target range, and could land anywhere between $50 million and $650 million. In the year-ago period, operating income stopped at $406 million. These official targets are not always accurate, and Amazon seems to play lowball with its guidance figures. In the second quarter, for example, top-line sales were expected to increase by 27% year over year but the result was 31%. The operating income range was just as wide that time, and the final result landed some $400 million above the top end of even that milewide guidance range. The big growth story within Amazon these days is not related to the mainstay online retailing operations. The company is an early leader in the cloud computing game, showing both rampant growth and solid profits in the Amazon Web Services division (aka AWS). In the second quarter, AWS revenue grew 58% year over year and accounted for 9.5% of Amazon's total revenue stream. That segment's operating income more than doubled to $718 million, eclipsing the North American retail division's $702 million in operating profit. Expect AWS to lead the way in both sales growth and operating profit this time. Anything less would be a disappointment for the flourishing cloud computing operation. How are the holidays shaping up? 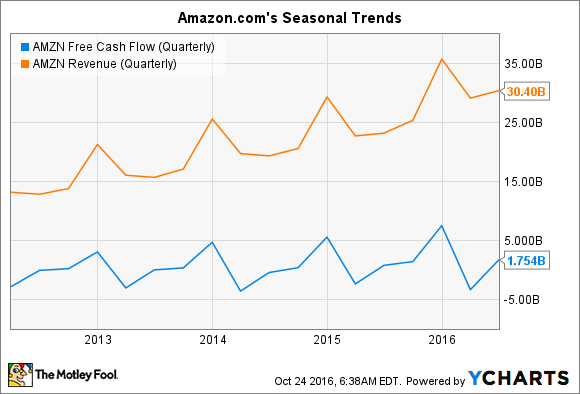 AMZN free cash flow (quarterly) data by YCharts. Therefore, Amazon's fourth-quarter guidance targets are likely to overshadow anything else in this report. Come Friday morning, Amazon's shares will likely move up if the guidance figures are impressive -- or down if management paints a pessimistic picture. Long-term investors should care more deeply about the actual results, of course. But guidance targets still deserve some of your attention because they can drive stock price moves in the short term.